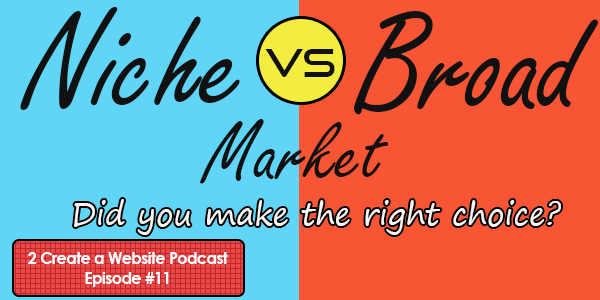 Niche vs. Broad Website – Did You Make The Right Choice? Last week a new subscriber admitted she should have narrowed down her topic (fitness) a lot more because the competition is just too stiff. Do you ever feel this way about your site? Or maybe you feel your site is too narrow and you’ve run out of things to write about. I’ve never really had an open discussion here about the decision to go niche or broad, and I’d love to know if you are happy with the choice you made and why. Having both a broad and niche site has taught me a lot, and one thing’s for sure, my niche (hair) site definitely converts much better as a whole because I know exactly who my audience is. Conversions and open rates are always higher than they are on this site. 2 Create a Website is not really a niche site because I attract people with many different site needs, experience levels, topic interests (WordPress, affiliate marketing, AdSense, etc.) As a result, not all content is targeted to everyone in my audience. So there’s definitely pros and cons to both kinds of sites, but the good news is, they both can work. We are what I consider broad as a DIY home and garden blog that focuses on home improvement projects but also are branching out to organizing, crafts and blogging. I am thinking of adding a more niche category within my broad content. For example: I am an affiliate for a specific blender and thought about doing recipes just for that blender instead of starting a new blog. I haven’t seen how many searches are actually coming up on the keywords yet but will do some research. Thoughts? The problem with broad, as you know, is separating email lists for those who may not want blogging tips or recipes and just want DIY home improvement so I am considering switching from Mailchimp to Convert kit (supposedly does a lot of what infusion soft does but for less and easier to use. ) I do see a lot of DIY blogs that are successful doing a smaller niche within a broad area. As always, thanks for all your tips! I’m also considering Convert Kit. However, adding a section on your site won’t necessarily make your site more niche unless you plan to only blog about topics related to that blender. But of course, if the product is of interest to the majority of your audience then it’s still a good idea to add content and promote it. But in this podcast I was referring more to making your entire site more niche and only focusing on that one topic so you get more conversions. Adding a section on one topic is a little different. Does that make sense? Shirleyb here. Decided I needed to get back to basics & am back at 2createawebsite. Don’t know why but I have not been getting your updates. So I signed up again with my most active email address. Anyway, in the past, I had been blogging so broadly I didn’t have a real focus & wasn’t getting anywhere. I ran across this site a year ago & it really got me to rethinking & researching what I was doing. I think I finally found a niche in writing about apartment living in 2 areas: transitional style (which is traditional + contemporary decor) & my own current journey of trying to achieve this style while having downsized from living in a house to an apartment. I now find that there is so much more to just write about “around” that topic. For example, it’s almost summer & lots of apartment dwellers have balconies, porches & terraces on which they want to enjoy (morning breakfast, evening dinners, etc.) So I’ve been able to write about decor & gardening on apartment porches. At one point, I had been afraid of this topic b/c the really BIG DOG on this block is Apartment Living.com. It seemed it had pretty much sewn up all the writing on this topic. Then I ran across a site that had listed 50 (?) best blogs on home decor. The irony was that only one site was listed for apartment living & the selector had stated that there just wasn’t enough blogs on apartment living. That encouraged me to focus on this niche but with a twist in writing from my own perspective & experiences. I still need to be consistent in writing posts, doing good research & marketing. My views are slowly moving upward. I feel I have a lot more to do but I’m encouraged. After all, people who live in apartments still want to feel they have a “home” they can live in. Hi Lisa, I thought I would spout off a bit on this topic since I have recently ventured into the broad realm of blog sites with my new site http://www.lazyoldgeezer.com. I have resisted doing this for a long time because I knew upfront it would a considerable taxation on my old noodle. However, blogging is as we well know is a lifestyle rather than an occupation, I bit the bullet and went ahead with the tasks at hand. If I were a noob, I would begin learning about blogging by starting off with a niche, perhaps even an micro-niche until I had developed the advanced set of tools and knowledge that is required to stay on top of the many tasks it takes to develop content, gain social acceptance, and reduce organizational confusion. On the flip side, now that I have ventured out into a broad design, I have had to increase my own knowledge of social networking, theme design, follower acquisition, and tool usage. My weak point being YouTube at the moment. Call me Camera Shy…lol. My content is offensive enough to some, let alone forcing people to listen my raspy voice and view my fuggly mug. Perhaps I will venture into YT in the not so distant future, as the broad scope of my new site feels to be a decent platform for my BS. and has begun to take on a personality of it’s own. I guess what I am trying to convince myself of is that although my niche sites bring in an income, the broad site keeps me from going mentally static. My name is Kevin, and I would like to thank you for your transparency while a little on the humors side of things, you’re a funny guy. I consider my site an authority site though its topic is broad. At the time I started online, I struggled with an learning disability so I began building broad sites throughout my online career. And thus, my site still consist of a broad topic — the theme though is DYNAMITE! In addition, I commend those of you that started out building narrow-topic sites or niche/micro-niche sites because it is much easier to rank for single key-phrases, as well as a much quicker time-frame to start earning an online revenue using a more topic-focused site. Do I regret … but of course, because as one reader mentioned broad topic sites are for the long haul, and not for the short; therefore, enabling a faster payout. But a broad topic site consist of a much larger commitment [as you mentioned] for the haul. Now … I am able to find time and focus attention on a much narrow topic of a site, and perhaps I too will start earning a quicker payout as you guys have succeed in doing. PS: A word about YouTube … Just do it, it helps to get over the butterflies in the gut. Start with a Niche site to make money so you don not have to worry about money, this frees up your creative energy to write about your passions. Broad websites are the best long term. You site must grow with you or you become a broken record. Most fitness blog i use to read are a great example, they start out with zest and after 3 years the passion wanes and they write filler posts that are not worth reading. SELF IMPROVEMENT is a great option as many things come under this topic but it if filled with twentysomethings who don’t have the life wisdom to pull them off. Basically have both create micro niche for passive income and broad site for long term. I just love the contents that are in this blog. I visit it often and i’m glad i have found one more unique content. I prefer a niche site. I think it’s better in many ways. For me niche and broad site is same as long as you’ve men to cover all the topics. If its one man army, then I prefer and recommend a niche site. Because this way I can really concentrate on a single topics and can be updated about the particular topic. Hey Lisa, not sure if I regret it per se (being on a broad niche) but I know for sure that the engagement and interaction I get today would be higher if I had a very specific niche instead. I’ve been thinking for a while in doing a website with a very specific niche and it’s something I’ve been delaying due to lack of time but I can’t wait to get it out there and see how it performs vs my “anything goes” marketing blog. Yeah engagement is probably the biggest issue with covering too many issues but the good news is, both can work. Thanks for listening to my podcast! What is your advice for someone who is just starting out? where should one start from in 2015? I’ve heard that the “small niche website” is dead, as it’s not easy to rank good in google today, and also because of the sandbox period. I am already working on one website, which I have created last December, and currently it’s getting less than 1000 visits/month. how long does it take to start seeing good results? Yes I would not do a small niche site today but an AUTHORITY niche site. That’s a site that has a very defined audience BUT it’s large enough for you to earn and more importantly, there’s enough content ideas for you to constantly add content over the time. Finding the right niche is really the trick but it’s not just about selecting the niche it’s about getting your angle right. An example would be my hair site napturallycurly.com. There are tons of natural hair sites out there but I focused on the journey of going natural. (Going from chemically straightened hair to naturally curly hair). Not many people were doing that when I started that site so that let me stand out. So I documented my journey on YouTube and focused on that when I started the site. That’s an example of finding a niche and then also taking my own approach to the topic. Oh and I didn’t answer your last question. The how long varies on the competition and other things so I could never answer that with any kind of estimate or certainty. This was a great podcast episode. I agree with your views. Looking forward to more of your podcasts Lisa. I know you made a remark about broad topics such as sports but would you consider this a broad website? My site only focuses on covering the NBA,NFL, MLB and College Football and Basketball. I would like to reply. Your site can be interpreted as a broad site because of the type of coverage [NBA, NFL, MLB, College Football and Basketball] you indicated your site covered. Keep in mind though that sports are a huge subject matter or topic, e.g., NBA, NFL, MLB, College Football and Basketball, etc., as you stated the type of coverage your site focuses on. A sports site can also be niched down to a subset … less broad type of site. The flip side of the coin is that you are in the cool zone because people love sports and news about sports, and that’s what your site covers. I agree with Kevin. It’s still pretty broad because there’s a good chance that your audience may only be interested in 1 or 2 of the subjects. For example I love the NBA and NFL but don’t really follow college sports. So I would probably tune out on the college posts. A better example of a niche site with this topic would be focusing on a specific team. So if you only posted about The Oregon Ducks then you would know… 1) Your audience is interested in college basketball, they probably either attended the University and/or they live in Oregon. Imagine how laser targeted your content could be? Granted it’s a MUCH smaller audience, but it may be easier to reach. And what a lot of people do is they start out by focusing on a laser targeted group and once the traffic grows, they branch out. That’s a better approach then starting too broad… especially if you are focusing on ranking in Google. Thank you for the compliment. And I agree 100% with your observation and advice in lieu of my reply to Derrick’s comment. And thank you for refining my example of a niche site to a more specific one. I’ve always admired how you interacted with visitors and gave such clearer perspective with hopes of them becoming successful with their site or business. There need to be more Webpreneur’s like yourself, and perhaps there would be more people being successful. Wow what a compliment! Thank you Kevin. Hope this what you are referencing when you say Show Notes. Response to Podcast # 11. I have a website with FASO which I want to keep, which is broad. I think that I understand what you mean by too broad. When I started my website I did it so that I had somewhere to have my customers look to view my other works. But now, I tried to do a Word Press site- actually I have it but never developed it, I want to move my jewelry from the home site to its own area with a shopping cart. This I am assuming is what you mean by a niche. Except now– I am not sure if this is a good decision or even where to start. I have thought about an Etsy store and I like Pinterest . 1. Start a new jewelry site on Word Press- found out there is a difference between org and com on WP not sure which to use or how to continue –. I have followed u for a long time. I just never write you. Nice Tips. Thanks for providing valuable information. I chose broad, God! WHY! WHY DID I CHOOSE BROAD!!! Thanks for sharing this with us Lisa. I just would like to share a part of my experiences. When I was starting my online presence I also did some mistakes, many of us surely did. At first I made a blog that’s too broad. It was more of a learning phase for me. It did not turned out to be very successful. So I did some research and l learned that a niche blog can be more efficient. And then I launched a niche blog. I wrote and post articles regularly. At some points I find myself struggling about what should I write next because it seemed that I have covered already the areas I need to cover with my niche. So I did some research again. To cut the long story short, it took me a couple of tries to finally find the right niche for me. The lesson I learned most? It is really very important to take some time researching and analyzing things before we finally jump into deciding what we really want so we can avoid or at least lessen wasting money, effort and time. And oh, I learned to be more patience and determined. That last paragraph about research is so important, especially today. I think people assume they can just jump into a topic. Sometimes that works, but you really do have to understand the needs of the market and the competition. Thanks for stopping by. I like niche marketing for two reasons one is it narrows down who your Ideal client is. This is important to give them quality content, also knowing them helps when it comes to monetizing. In other words you can calculate what they are willing to buy. The other reason I like niche is because when doing the keywords it is easier to rank for niche words. This is to say it is better to be on the first page for something 50 people search for than to be on page 28 for something 5,000 people search. I thought I responded to this already, but thank you so much Rob. What a nice compliment. In my opinion, its much harder to get the success with a broad website. Even if at the first side you’ll think a website with varied content will atract more people the truth is far behind. More subject means less content optimization. To reach the succes you have to pick a niche and do your best to be number one on that niche! My site is not yet ready it is still in build process. The subject I guess is broad as it taps into a multi-million $/£ business worldwide. However the subject is broad (mountain bikes) but broken down into its components I reckon it becomes niche. It also combines all sorts of other subject areas (health, fitness, diet, fashion, clothing, lifestyle, humor, holidays, etc etc). Therefore the potential for a huge site is endless, with tonnes of links both inbound & outbound and internally (navigation). So my point is, as I am completely obsessive about the subject (as most mountain bikers are), finding content is not difficult. Finding keywords likewise is easy, BECAUSE obsession leads to knowledge and particularly knowledge about niche requirements…you know how to do something, where to buy something, what of the millions of options should you match with what? The typical re seller web sites list the zillions of products but NEVER provide the correct matches..so there is a niche. The sales people within generally rely on customers to contribute etc etc. Their keyword efforts I suggest are ZERO otherwise they would never get anything done. So if you create from a subject of passion, and really understand how much knowledge you have about your subject then you are able to contribute to an audience. If however you decide to find a niche based on best commissions from CJ / Amazon etc then likely you will get writers block, have to out source the content & will never understand the keywords required…for sure a machine will not either. So Niche or Broad? Maybe more important is ask yourself “Care or careless” about the subject. As this is all within Lisa’s “how2Create” site I suspect we are those that CARE. If we were within a site that bombards you with – get rich quick – pumped up motivational – multilevel marketing type sales speal the answer would be careless – its a numbers game – make a quick buck and run like hell before the customer realises you have no knowledge at all and are therefore a preditor….I my view (limited to me of course) this is why Google does what it does. It wants the creators of sites to create content that the consumers will relate to – like – and get benefit from whilst interacting with it…. I hope I am broadly correct otherwise I’ll create a site for me and a few others and will never be found…. Yes Lisa, I do agree that both works. As for myself, having a broad topics allow me the luxury of writing anything that is part of the Internet Marketing elements whereas focusing on just one niche can really “brain-drained” as far as article posting is concern. Would having a blog/website on the topics of “starting a/an online boutique” (or basically talk about starting, promoting, and growing their fashion boutique using the internet and all that jazz stuff that comes along with it?) Reason I ask is because I’ve had 2 boutiques online and done extremely well. HAD so much fun!! Made LOTS of money with it and people STILL email me asking me for help (after they have watched a few boutique videos I posted on youtube long time ago. Still very amazed I still get emails and FB inbox msg regarding those few videos). So would this topic for boutiques honestly be to broad of a niche? or niched enough to run with? I ask because I just do not know it all. I rather ask advice then jump in and waste tons of time. I am just overwhelmed and burnt out. My other site is (I do believe) very borad where “I show moms how to start and grow successful online businesses, blogging for profits, and more” …That’s my primary site/blog currently and I talks about a whole lot there. I am feeling overwhelmed with that. I believe niche is way more better for me. And yes, niche coverts so much better for e too. Just gives me a piece of mind man no lie!! Just makes my life so much more fun (and of course easier when it comes to content creation emailing and so forth). Thoughts (on these 2 struggles of mine)? I did some quick keyword research and looking at the numbers I would say it’s narrow enough. A boutique is a specific kind of store AND you’re already having success so that is a big bonus. That would definitely be my caveat…. already succeeding in what you’re writing about. For example a lot of people tackle the “how to make money online” space (which is competitive) but the bigger problem is they aren’t having success. You are already doing well and that success will build credibility. Not only is the keyword competition low for the boutique business but you are making money so that will definitely help set you apart. Thanks for the update. Had I knew things would change as hugely as they have when I first started learning about IM, I would have, no doubt, done things differently. And bouncing back and forth between site topics or not really understanding how IM works or having a deep enough understanding of a niche website, can cause all sort of chaos in your life. And since Google has made a tremendous change in search data and how our site is discovered now — don’t help either. But, one of my sites carries a very competitive theme or site topic … how to make money — the lifestyle market. Yesterday, the site was on page 8 [4 down] of the SERP listing, but I added the “keyword” [search term] in two other places on the site. Today, it’s on page 7 [7 down] of the SERP. I like to believe that, even though, a site has a broad top [or theme], and using, without stuffing, your search term [keyword] in various locations of your site. You still may have a chance of moving your site closer to the first page in the SERP though I am still experimenting. In addition … and thanks to you for mentioning … we have to find our own approach or angle to on-line success. Something else I’ve noticed; by using synonyms and other less competitive search terms [keywords] also better your chances. Plus … your inbound linking and connecting to your social platforms all have an impact on ranking. When considering a “Niche” site, one should consider a “sub-niche” or “micro-niche” site because the comp is extremely limited … keep in mind though using “synonyms” or less competitive keywords should help get the job done. Excellent advice because in the past I found it really hard narrowing down a topic and making it a smaller niche because while creating my site, I always had an overwhelming feeling come across, causing me to feel that my site would be better than other sites out there and that I would be the one that would dominate that topic (delusional thinking). I kept making that mistake over and over again and always ended up not getting traffic to my website due to the competition out there. I have now learned how not to get myself entangled in that trap again. I have to agree with you a “broad” site is much harder to achieve some degree of success. And in my opinion, a broad site can have too many things going on at one time which can cause visitors to be confused or to achieve satisfactory search results. Web sites should surround a specific purpose, need or one’s aspiration [despite its broad topic] and not aimed at multiple issues. One of my sites has a broad topic or theme … the “lifestyle market” … making money online. More importantly, when considering what kind of “market” we’re going into, e.g., the health and fitness or the lawn and gardening are both broad topics. With either topic, they can be narrowed down to a smaller portion — niche, sub-niche or a micro-niche website. Another example could be from Lisa’s site … like this one. Lisa’s site [in my opinion] surrounds a need … “How to build websites” though she’s able to focus on other money-making strategies … she has a broad “topic.” Again … she’s able to refine her topic and address other IM issues. I would think one the most important thing here is not what I think, but what actually works and bring results. IM doesn’t surround what I think, but where others have had some form of success, and that “form of success” can be duplicated. Thanks as always Lisa … for AWSOME content and advice! I appreciate you sharing your story. I’m sure many can relate to this. I had over 100 different keywords for content pages on different sub topics on solar energy. There was no way I was going to accomplish an encyclopedia type site on my own and really get down to providing much more information. There’s only so much time in a day and I couldn’t do it 24/7. It would have been much better narrowing my site down to one topic and write a lot of good content around related keywords. For instance, instead of having a site that addressed topics of solar panels, solar water heating, passive solar, active solar, solar inverters, solar charge controllers, energy efficiency, lighting, motors, building shell, insulation, infiltration, air conditioning, etc. I should have just focused on something like solar inverters: stand alone inverters, grid tied inverters, battery backup inverters. Do you see what I mean here? In having a narrow niche, it’s much easier to compete than having a wide open niche like what I did and not compete and make money. Sure, I had lots of traffic going to the site for the first two or so years and it made a few hundred dollar per month. But, it got to the point some of the information was becoming stale and needed to be updated. When there are numerous topics inside the site, it make updating and competition more difficult. Consequently, focusing on a single topic is much better in my opinion. “Narrow Niche” are the keywords here. That’s my $0.0000000000000000000000002 worth of opinion in today’s world of the Internet. John, I really appreciate you taking time to share your story. I agree with you. Good information, Lisa! I am just starting and need to get traffic. I am sort in a broad area (fabric) but I don’t see a way to narrow it down to a niche at the moment. I have an ecommerce site and write a little blog but I have all of this inventory already that I need to sell and I don’t see a way to really narrow it down to one or two things. I am researching ways to offer something that other’s don’t but I am not there yet. There are tons and tons of fabric, quilting, sewing and crafting sites but I am having trouble seeing a way to set myself apart. Any suggestions for that? I know that there are so many different kinds of fabrics out there. Do you sell any specific kind or is it just a generic fabric. It’s fabrics of all kinds – I thought about just specializing in special occasion fabric but that wouldn’t work right now because of inventory concerns – I don’t believe I have enough variation. I don’t have the $$ right now to start buying wholesale – I am stuck with the inventory that I have right now (and that’s alot!). I bought out a fabric store last summer which took my savings for the business. Anyhow, I have been selling it on auction sites but I want to be my own boss and not have to put up with their shenanigans. I would appreciate ideas. Janice, have you ever thought about doing YouTube videos/tutorials on how to make different things and then you could promote the fabric you sell in the video? Seems to me that would be a great way to get in front of people. I have thought of that – I have a little stage fright on that one 🙂 I am not one to even take a selfie. And it’s another thing to add to my already overwhelming self-learning. But excellent idea – I will work on that and when I get a video made maybe I will post it. Well stay tuned. That’s what my next podcast is going to be about in April. 🙂 What a coincidence! I’m going to share techniques that helped me get over mine. We Asian specially Pakistani want to earn from Websites. Looking for good topics but our Niche have no good results. We try to launch websites for USA and get better results. Great idea about Google News if you have put together something that is truly relevant. Found this link to submitting to Google. A lot of set up make sure your site is professional and ready but you are doing this for the long haul. Thanks for sharing the links on Google News, Steve.